Utilising the apt migrating tool leads you to explicit conversion of MAB contacts to CSV, VCF and PST format in efficient manner. The tool also supports migration of multiple MAB files. However, you have to add the MAB files one by one for conversion. Convert MAB to PST, CSV and VCF without any hindrance. 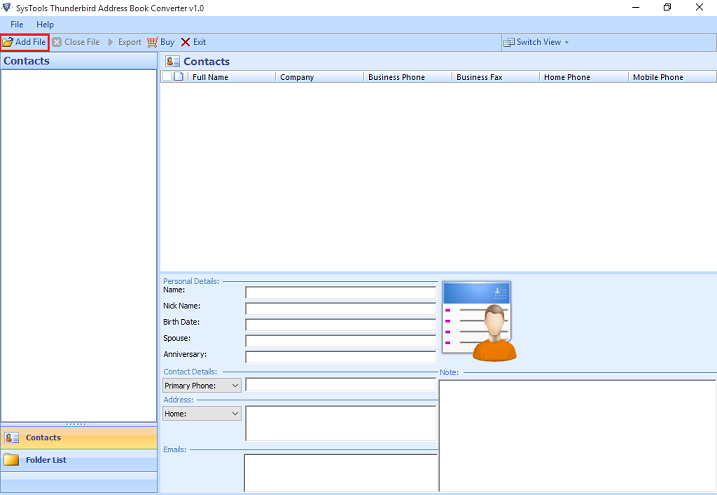 Option to select desired contacts is also available as per user&apos;s need. Provide an option to select the MAB data in form of folder or file. Thunderbird Address Book Converter allows you to sort all the contacts on the basis of options. Facilitates with the preview of all contact details with attachments. There is no need to install Outlook on your machine for PST conversion. 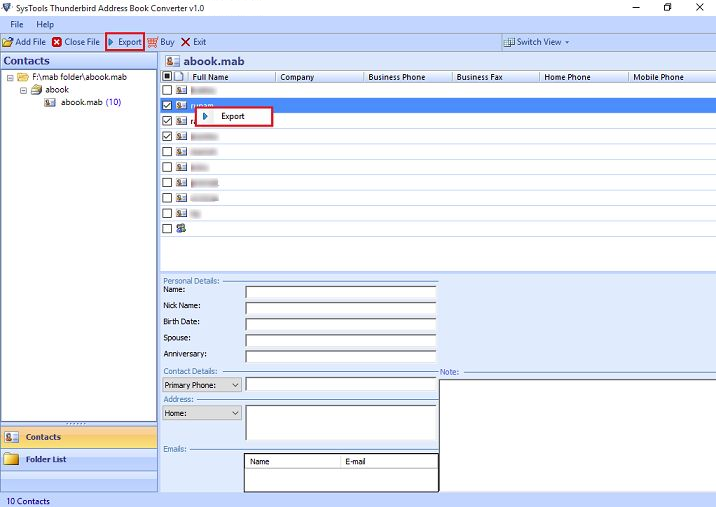 MAB Contact Converter also enrich you with an option of saving the entire export report after conversion. Using Thunderbird address book exporter you can go for relentless migration of your entire MAB file to PST, CSV and VCF format.This application easily handle the MAB files of large size without any difficulty. 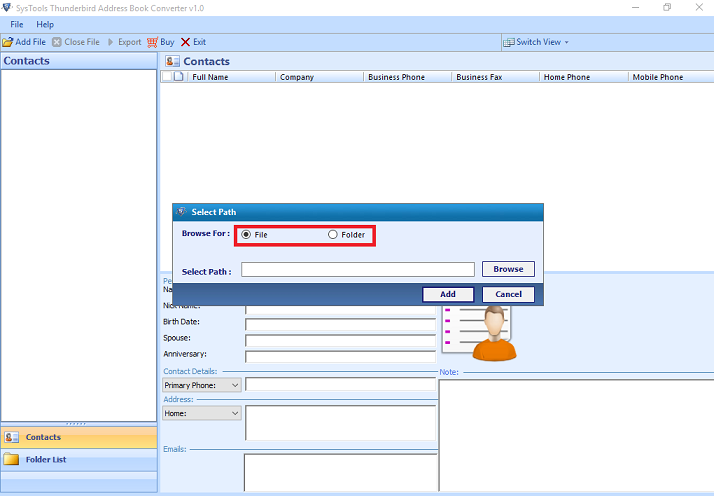 You can also opt for selective migration of contacts by enabling the desired check box. The software comes up with user friendly interface resulting in efficient conversion process without any confusion and trouble at user end. This tool performs whole task supporting all the versions of Thunderbird including latest version 45.6. After selecting the MAB file , MAB contact converter also offers you an ease to preview all the contact details with attachments. And you can also sort the contacts according to the options available like: Full Name, Company Name, Home Phone etc. So that you can select the particular contacts by avoiding the time consumption in searching the contacts. 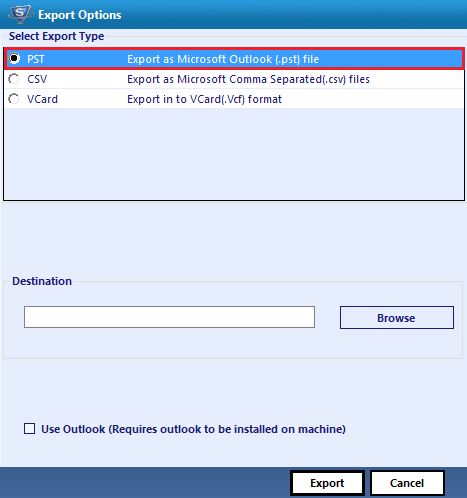 During conversion process from MAB to PST format, there is no need to install Outlook on your machine. However, if Outlook is already installed on your machine then you can enable the option Use Outlook. In case of MAB to VCF conversion, After the completion of entire migration process, every contact will be stored in the form of separate .vcf file format with the version 2.1. You can merge those distinct .vcf contacts into a single .vcf file afterwards as per your need. To understand the process or just for a trial, You will also find an option of Demo Version. However, only 25 contacts can be converted using Demo Version. For the conversion of complete or multiple MAB files, You need to purchase the Full Version of software. If you are using Thunderbird as an email client then all the contacts are being saved in MAB files within the database. The contacts of every email account are stored in MAB file format i.e. Mozilla Address Book. You can easily access all the contacts from MAB file. abook.mab: Whenever any contact is explicitly added in the personal address book then that particular address get saved in abook.mab file of Thunderbird. history.mab: As the name suggests this specific file is comprised of all the contacts that are accessed while receiving or sending the mails. It contains the information about all the contacts that have been used in the email client. impab.mab: If you are importing any other Mozilla address book to get all the contacts back. Then those contacts will get saved in impab.mab file. By accessing impab.mab file you can obtain all the contacts. If you want to switch from your current email client to another that does not support .mab file format. Then, It will get mandatory for you to convert your MAB file to another file format. So, keeping Users&apos; requirement in mind Thunderbird contact book converter is introduced. It facilitates the users with efficient conversion of MAB file to PST, VCF and CSV without any corruption in original file data. Free Thunderbird Address Book Converter only convert first 25 contacts does not allow the complete MAB file conversion. Step 1: Install and Run the tool on your machine. File: You can choose this to select a single .mab file for conversion. Folder: This option will allow you to select a particular folder comprised of multiple files. Step 3: After that by enabling desired check box, You can export selective contacts as per your need. Step 4: Now, You will find the option to select the file format, in which you want to convert file. In case of conversion into Outlook data file format : If you have Outlook installed on your machine then you can enable the option Use Outlook. Is there any file size limit of MAB file for the conversion? No, there is not any file size limitation. You can convert files of any size. Is there any specific role of enabling &apos;Use Outlook&apos; option? No, there is not any specific role of this option. If you have Outlook installed on your machine then, you can enable the same option. Would I be able to migrate my MAB contacts with attachments? Yes, you will be able to retain your contacts with attachments without any alteration of data. Is there any need of extra application during the migration process? No, there is not any need of extra utility. 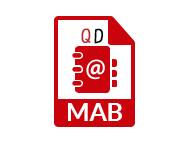 MAB data will be easily converted using MAB Contact Converter only. At work I had been using Thunderbird. That causes the inability to use the data on Windows Outlook at home that was quite frustrating.I was stuck with a query, How to open MAB file in Outlook? However, coming across Thunderbird Address Book Converter from QuickData helped me out in tough time! 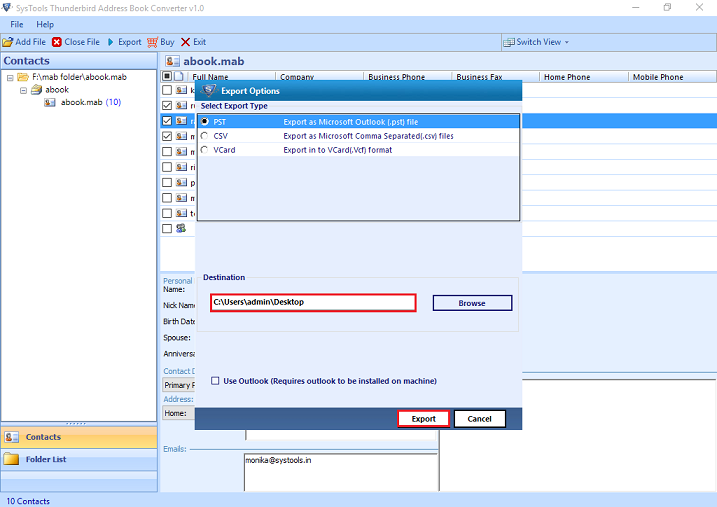 I was so fed up with the tools not able to access my MAB contacts in Outlook. I had several MAB files that should be converted into PST file format. Thankfully this tool saved a lot of time in transferring the MAB contacts to Outlook.